Nearly everybody who talks about the Magic Kingdom eventually tromps out that old canard that the Magic Kingdom offers fewer quiet, secluded corners than Disneyland. While this is technically true, it is essentially meaningless. Disneyland grew up in fits and spurts of construction and so certain areas bear the stamp of eccentric construction which wedged areas into some sort of conceptual or literal dead end. 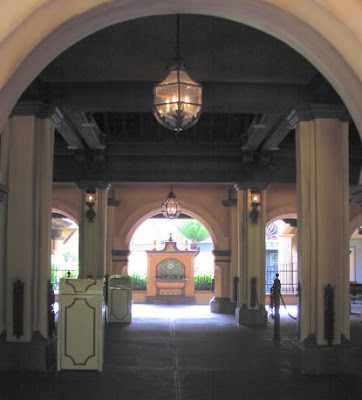 Anybody who's used that bizarre little arch that leads from Carnation Gardens on Main Street into Racho del Zocalo in Frontierland knows that this unique feature was more a consequence than a goal of expansion. The time, expense, and limited space afforded by the first ten years of Disneyland construction absolutely ensured that strange little back corners would come into existence, but I think it's fairer to see these as inevitable consequences than admirable qualities. They're fun, yes, but they're also accidental from a strict design perspective. What I'd like to celebrate here is not the conspicuous accident, but something I've taken to calling the "engineered miracle". 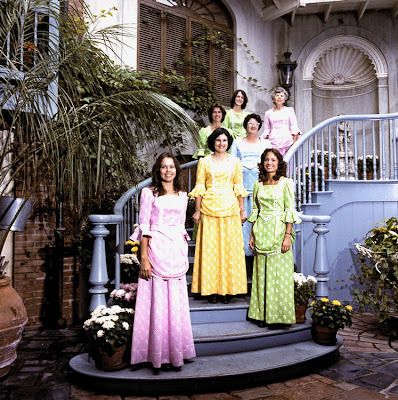 And for all the complaining I've just done about Disneyland, she has perhaps the most famous of them all: The Court of Angels in New Orleans Square. 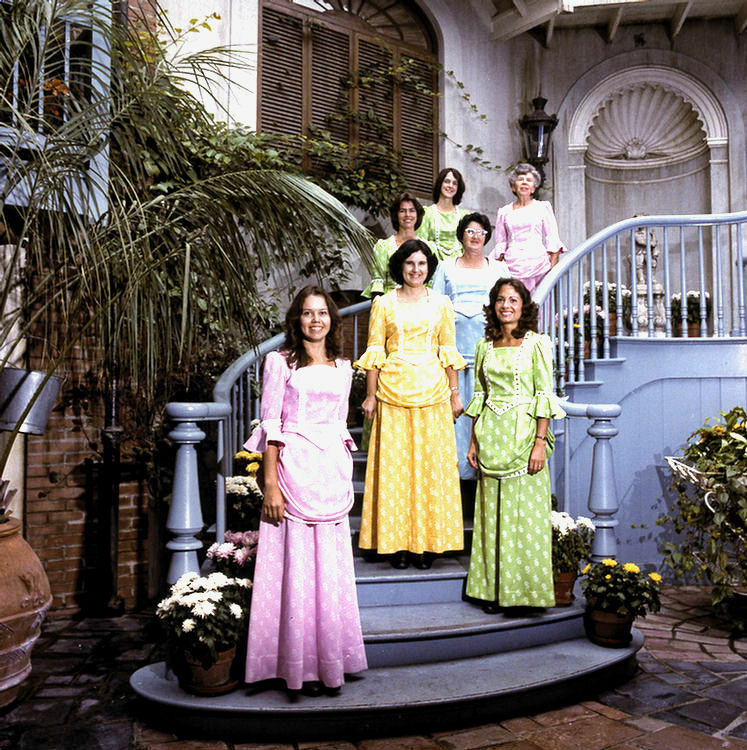 The Court of Angels is indeed a beautiful place, and her beauty and fame is such that many southern California families take their annual Christmas picture on those winding steps. It is so famous because the moment you first see it, it is one of the most indelible moments to be had at Disneyland; whether you stumble out of a nearby shop or get lost looking for the bathroom, the atmosphere is quiet, contemplative, almost sacred (assuming it's not filled with Annual Passholders taking Christmas photos, of course). But for as beautiful as it is, you'd be foolish not to find the courtyard. It's about as conspicuous as can be. 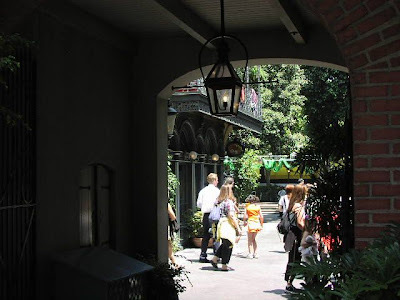 If you walk past Royal St leading into New Orleans Square and turn left past Cafe Orleans, you have a perfect view into the courtyard, with the steps framed in such a way to invite you right in. From this view, past the old perfume shop, it is almost as directly stated a "weenie" as Sleeping Beauty castle at the end of Main Street. Since almost nobody takes this road, most people find the Court by worming their way through the heart of the Square and coming across the side entrance. Either way you go, there's even a sign placed outside inviting you in - this is not accidentally placed, and it is not accidental that you found it. WED Enterprises' ability to guide you directly towards their "secret gardens" is one of their strongest assets, and although the Magic Kingdom may not be strong in the accidental corner or the back-of-the-house pathway, it is absolutely rich in the "engineered miracle", the moment of cinematic design which leaves an indelible stamp and marks the themed space as a consciously conceived, deliberately constructed creation. The Magic Kingdom simply sings a song of design, and I'd like to highlight what I think of as nine of the best places to appreciate this. Now nearly everybody knows these days about places like the rocking chair porch in Liberty Square, so I will not include these here. What this is a list of places I invite you to spend as much time as possible in. Unlike certain areas of Disneyland, Magic Kingdom's multifaceted, rich tonalities are not immediately evident, especially now that some of these innovations and brilliant moments have been imported or duplicated at other parks. These are just nine places where everything satisfying and unique about WED design comes together, and they never fail to make my heart soar. 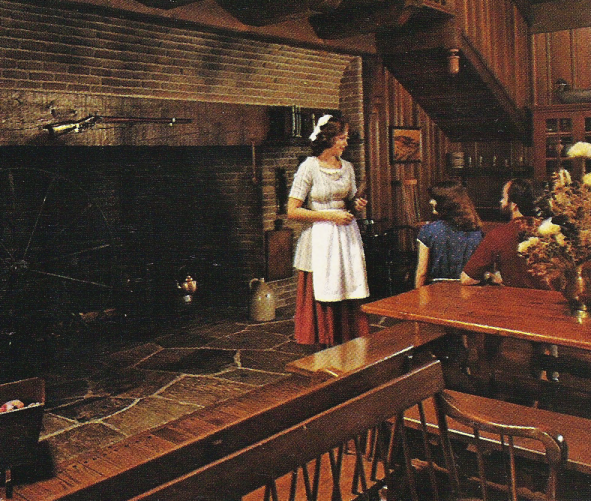 Liberty Tree Tavern Lobby - Throughout the Vacation Kingdom, Disney profitably experimented with the concept of restaurant design, probably due to saturation with the concept in the development cycle of New Orleans Square, where they fitted four unique restaurants with a variety of styles and furnishings. Of all the gorgeous restaurants Disney created in this first decade - the high-ceilinged Magnolia Room with her rough hewn rock wall, the airy Village Restaurant with an open hearth and indoor forest, and the queen of them all, the Empress Lilly - I sometimes think that Liberty Tree Tavern is amongst the best. Although the interior decorations have been greatly revised, the layout still bespeaks of complexity and tact. If you can't appreciate how the various speckled-glass windows peek out at carefully framed, bucolic Liberty Square landscapes, each carefully selected enough to be a canvas, you're not trying. A great interior deserves a great first statement, and the Tavern assembly hall is one of the best, with its great rock fireplace and sturdy, dark stained paneled walls. And who could forget two of the coolest - if tiniest - bathrooms in all of Walt Disney World, tucked way upstairs behind the eave of the roof? The balcony overlooking the lobby is another chance to admire this memorable space, but the narrow climb upstairs is the real joy. The bathrooms are located in such a way to suggest upstairs rooms, of course, much like the real lodgings Disney's tavern is modeled on, and anybody who has never ascended the stairs and imagined gripping a burning taper on their way to some upstairs lodging in a dark night in the eighteenth century is missing half the magic and brilliance of this place. I am a New Englander, and like most people from that area I carry with me a strong association with that land and its' history, and Liberty Tree Tavern speaks very strongly and authentically to me as a Revolutionary War tavern, much like authentic examples I have visited and enjoyed. And I guess that's the real compliment - rather than being 250 years old, Disney's version is 40, and it's flat, open, and unlike a real tavern in general shape and appearance, but the spirit is there, and strong, and memorable. It may be the real Spirit of '76 in Liberty Square. Alligator Bayou - This is a scene alongside the Rivers of America, and although I've spoken in the past about my admiration of this scene in particular, I'm going to frame it in context a bit first. What this really is, is a scene lifted more or less directly from the Blue Bayou Restaurant at Disneyland, although of course context, in this case, is everything. It is a Marc Davis design, and he likely thought it up back in 1963 when the Blue Bayou was going to be called the "Thieves' Market" or "Blue Bayou Market" and have multiple shops and restaurants in it. 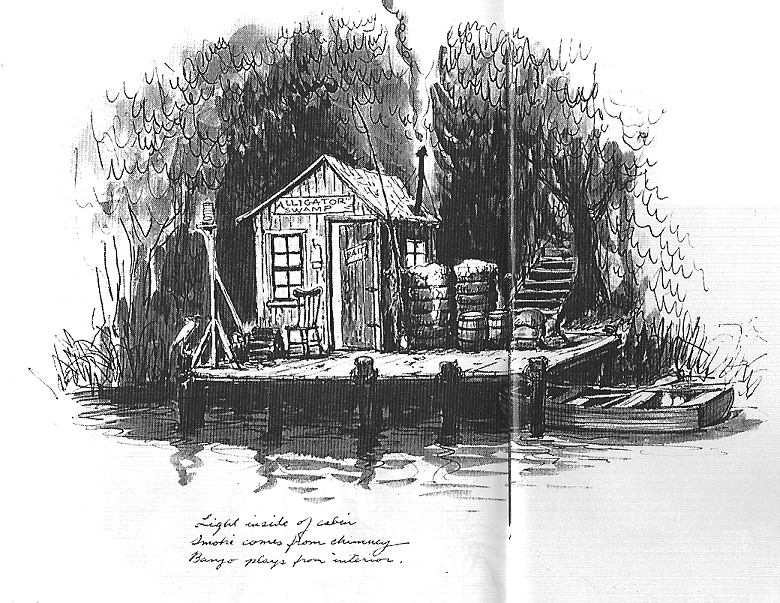 While the concept and figure do appear in the Pirates of the Caribbean of 1967, they do not really mirror Davis' concept art at all, whereas the Florida version is a perfect match, down to the crooked sign above the shack reading "Alligator Bayou", the "Bait" sign on the door, and the flattened gator skin on the wall. And whereas the Disneyland version is more of an atmospheric curiosity on your way into the ride, the Florida one is the full-blown atmospheric tone poem in and of itself... with an additional Davis sight gag of a dog and a jumping fish. But why is it there? 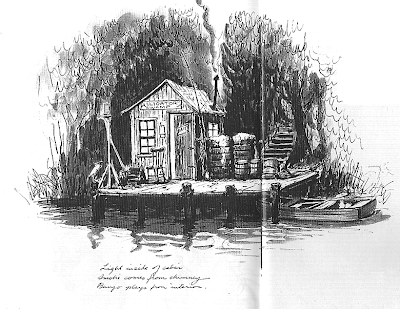 Well, "Beacon Joe" (as the figure in Florida has always been known) was a 1973 addition to the pre-existing "Alligator Bayou" scene along the Florida river. More to the point, by Summer 1973 Disney would likely have known that the Florida Pirates ride would not be replicating the Blue Bayou scene and so the figure was free to place along the river without creating redundancy. But the success really is in the placement here, because the effect of the same scene in the bright open air is so dramatically different than the effect of the scene shrouded in artificial semidarkness that the lift is forgivable. The music is different too, less mysterious than the Blue Bayou version and more lonely. It echoes all through that part of the river, across the water and through the trees, and more than just another audio track in a fake wilderness full of them, in lends the scene the gravity and dimension of authentic, poetic Americana. And so Beacon Joe with his dog, rocking away his days right on the edge of the wilderness, becomes one of those really unforgettable Magic Kingdom moments, an infinitely calming scene as the Riverboat steams past. I've always thought of it as Marc's John Ford scene - quiet, slow, but full of understated humor and simple beauty. It's hard to make a case for much of the changes to the original Pirates ride, but I'll take Beacon Joe over the "Bayou Old Man" any day. 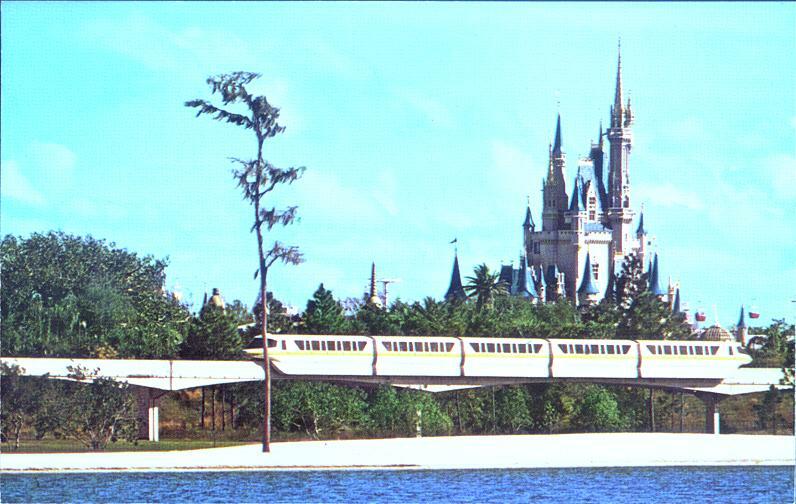 The people at the Oriental Land Company must have thought the same thing and the Beacon Joe scene was added to the Tokyo Disneyland river in 1987 along with Big Thunder Mountain - despite already having the same figure in their cloned Blue Bayou from 1983. Hospitality House Courtyard - Years before I became aware that the Gulf Hospitality House on Main Street (today the Exposition Hall building, soon something else again perhaps) was intended to be a hotel, I knew that the little side court to the south of the main entrance veranda was something special, something worth lingering in, a common area for a simple but beautiful guest house. For many years it was the entrance to The Walt Disney Story attraction, and it's hard the say whether or not all the features which can still be appreciated today were there on opening day in 1971. With big, fruit-bearing trees to the north and that gorgeous fountain amid landscaped steppes up to the train tracks to the south, pebble paths and climbing ivy, it's one of the most unexpected surprises in the Magic Kingdom, a very beautiful and down to earth little pocket of the Vacation Kingdom. Stop by sometime and you'll be surprised, especially in the morning or at dusk. The water in the fountain may no longer run but the sunlight filtering through the wide veranda past the berm is such an understated effect it can be hard to remember it was designed. Although the Hospitality House never featured rooms, the building is connected to the Magic Kingdom service tunnels, probably for laundry and other anticipated needs. We'll never know what the Main Street Hotel would have really been like, but we can enjoy this little flower garden, a short stay in a neverland of Walt Disney World, in its own way as memorable as the Contemporary's Grand Canyon Concourse or the artificial Polynesian garden just across the water. Top of the Swiss Family Treehouse - certain attractions are absolutely essential, and the Treehouse is one of them. 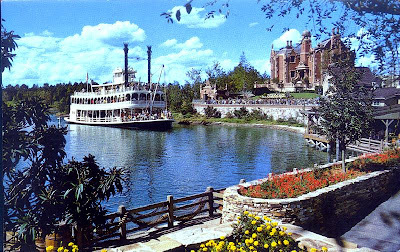 Most of the original "lands" in the Magic Kingdom featured what could be called an "orientation" attraction - the Riverboat showcases and embellishes Frontierland-Liberty Square, the Skyway showcases Fantasyland, the WEDWAY, Tomorrowland. The Treehouse is Adventureland's "orientation" attraction, and it sings a song of design miracles, most obviously at the very top, alongside the 'Master Bedroom', where the intricate Adventureland Veranda facades may be reinspected from a new angle and beyond it one may observe the castle, the rising intricacy of the Fantasyland rooflines, and the dramatic angles of Tomorrowland. It's one of those places where WED seemed determined to impress upon you the scale of their achievement, and the perfect angle the Master Bedroom is situated at - cheating out back towards the hub - is the best indication of this. Father and Mother don't have a skylight in this version; they have an entire Kingdom to look out upon. Who can blame them? 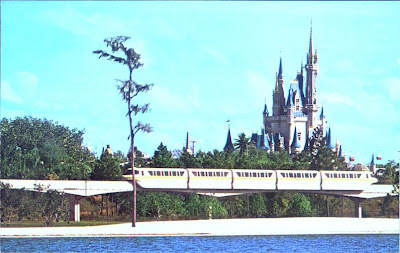 One aspect of this scene which is lost today is that WED next had the pedestrian path wrap around the side of the Master Bedroom and face back towards the Seven Seas Lagoon, where I imagine an astonishing view across the water of the Polynesian Village awaited. 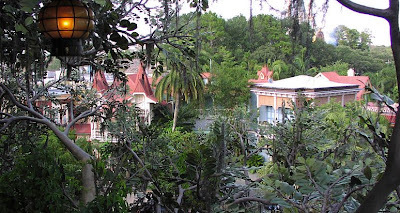 In the foreground, poking up through the trees, were the three tall spires of the Cambodian Ruins of the Jungle Cruise and, farther back, the very tips of Schweitzer Falls and the lions' den. Growth has made this view largely extinct, although a sign is helpfully placed to inform us that this is the "Jungle Lookout". Perhaps in the future some clever Imagineer will selectively trim back the tops of the wall of bamboo and let this scene impress again. Early postcard demonstrating a view from the "Jungle Lookout": At the very left is the top of the treehouse, to the right two of the three spires of the Cambodian Ruins. Small World Gate - The Magic Kingdom differs most markedly from Disneyland perhaps in her ruthless efficiency, in the way that everything is designed for maximum ease of utilization, of movement, of supply. Buildings are clustered so that restaurants in very different areas are fed from the same kitchen. Pathways are extra wide and all of them slope downhill into drainage systems. Entrances from non-themed areas take the form of large gates which can be rolled open wide enough to drive trucks through, which is actually what happens at night. Sometimes these are carefully themed. Sometimes they're not. One gate which is carefully themed and placed and which indeed may have the most elaborate work around it is the gate which sits between It's A Small World and the Fantasyland Skyway, what is referred to officially as the Small World Gate. It's placed quite low relative to the pedestrian path, down a rather steep hill which leads to a wide road between the show buildings for The Haunted Mansion and It's A Small World. I bring this up because it's necessary to understand why it's so carefully done; because we pass it from an elevated perspective, if the Small World Gate were simply placed in the same plain way most of the others are, the show buildings for Small World and Mansion would be easily visible. Disney had a better idea. It's important to know all this to identify how a potential liability was turned into a beautiful feature, probably the only such gate in the entire Magic Kingdom to have such a carefully orchestrated effort at disguise. The area is positively scenic, and it is scenic despite the fact that the sole purpose of it is to drive trucks in and out of Fantasyland. The side of the Small World building has been treated with an elaborate castle wall, and additional interest is created with climbing ivy, arched doorways, and wrought iron lights. A decorative arch frames the gate, restricting the height of trucks entering or leaving but screening out much of the utility road behind it. In short the utilitarian nature of this rather ugly access point has been artfully disguised; you've probably been walking past it for years without thinking about it. But moreover it's a perfect place to stop and admire what WED got right about Fantasyland in 1971 instead of what they got wrong. Later pundits often point to the lack of quaint European atmosphere in this 1971 version of Fantasyland, but you can put the lie to all that by lingering for a few short minutes around the side of It's A Small World. Directly across the way is a row of Bavarian facades that put the Germany pavilion at EPCOT to shame for simple charm and elegance, and the Alpine landscape is lush and vibrant even without Skyway buckets puttering along overhead. The 1971 Fantasyland, which for too long has been stripped of her strongest visual components - the submarine lagoon and the Skyway buckets - has come under fire for not being as carefully or elabortely themed as the Disneyland version, a charge which for me has always seemed unfair (especially since Fantasyland in Disneyland was redone twelve years after WED's admirable effort in Florida). Small World Gate is a perfect spot to get away from the crowds, sit alongside the climbing ivy, and admire the pitched rooflines, old world chimneys, and basic appeal of an area where the design experts at WED took a sow's ear and made from it a silk purse of astonishing beauty, the engineered miracle itself. 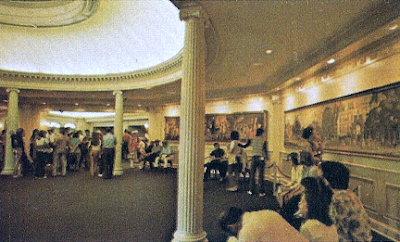 Hall of Presidents Rotunda - Attraction holding areas in the 1970s were a fairly basic concept. At the time that Walt Disney World opened in 1971, many of the queue areas were still based on the Disneyland model -- fairly plain switchbacks outside of the attraction. There was often a focal point alongside the queue, whether it be the show building's facade or a wall mural, and oftentimes they simply zigzagged along merrily alongside the load area with no particular memorable emphasis. The Jungle Cruise trundled along for twenty years past bare walls with no soundtrack, and many waiting areas like Peter Pan's Flight and 20,000 Leagues Under the Sea were only slightly more elaborate. This was really just a few steps removed from "cattle corrals" outside carnival rides, and it would not be until the construction of the Florida Pirates of the Caribbean that the concept of really elaborate waiting areas, of holding areas that could be fully developed atmospheric experiences, would be introduced. The lobbies of the original Magic Kingdom theater shows - perhaps because the designers decided that audiences sitting still through a whole show cycle needed something a little more complex to look at - took a different tact, from the odd three-terraced preshow area of the Enchanted Tiki Room to the fairly plain, tiny lobby afforded Country Bar Jamboree. Flight to the Moon was a plain glass walled chamber with a digital countdown above the entrance doors, and Mickey Mouse Revue featured trompe-l'oeil pink and white scenery on all walls of their lobby. But the Hall of Presidents received by far the most effort. The Hall of Presidents rotunda is still one of those places that seems utterly hallowed even today: quiet, contemplative, and authentically stoic. It is often confused for the Oval Office of the White House or the Great Rotunda of the Capitol; in reality there's no effort to even replicate a fake of either of these famous sacred halls of government but Disney's version is so subliminally effective that it immediately recalls such government spaces without remotely resembling any of them in the least. The fascinating fake skylight in the center of a shallow "dome" which suggests great height without bothering to actually achieve it; ten pillars ringed with complex plaster work; crisscrossed ceiling beams and sturdy baseboards, all in white, accent a rich blue and gold carpet to create a sense of a space seemingly imperturbable. In fact, the only thing that gives away that there is more of the show to follow is the functional open space and curtain-shrouded entrance. The elaborate detail of the Hall of Presidents waiting area may be a reflection of the fact that it was Walt Disney World's prestige project, or perhaps that it was expected to (and did) play host to huge crowds for its first ten years. Today, more or less unchanged for forty years, it's one of the few authentic pieces of 70's Walt Disney World left to linger in. 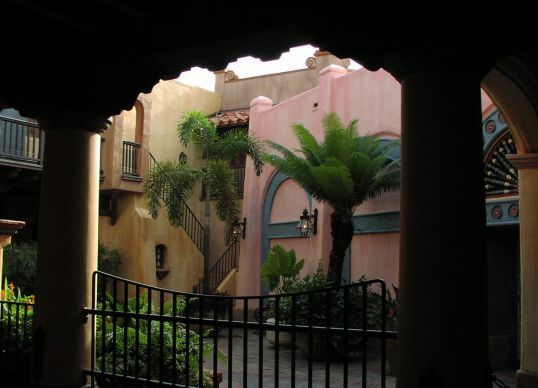 Pirates Courtyard - Caribbean Plaza's great achievement and also primary identifying visual component is the alternation of bright, sunbleached stone with dark, gloomy woodwork. Courtyards dot shops and restaurants with goods tucked in gloomy back corners and windows seem unable to let in enough light. I've suggested in the past that this effect is intentional and that certain areas of Caribbean Plaza accomplish a leisurely "simulated sunset", where light slowly fades away and we penetrate dark interiors into the dark and constant night of the Pirates ride. Nowhere is this more evident than the Pirates of the Caribbean entrance plaza, a dreamy twilight of a place bordered with dense jungle on one side, a sun splashed courtyard on the other, and the heart heart of the fortress dead ahead. This side court is our item of interest. This little back area, which once served as an exit point for a shop, and once had a working fountain, is one of the Magic Kingdom's most distinct side trips, the Florida analogue to the Court of Angels except unlike the Court of Angels it doesn't even seem like you're supposed to find it. It seems today to be some strange forgotten space, there to add subliminal atmosphere to the breezy entrance plaza nearby, like a set you're not supposed to enter. But you can. Inside are charmingly downscale doors and windows, a fascinating forced perspective balcony running along two sides, and these fascinating ceramic geese overfilled with silk plants which seem to have been beamed directly from the 70's into my subconscious. Even on busy days this odd little courtyard seems deserted, but in it is everything beautiful and strange about the Magic Kingdom. Those of us with an even keener eye for obscurity will recognize it as the staging area for the cover photo of the only album ever cut by longtime Magic Kingdom entertainment group J.P. and the Silver Stars, under the title "Walt Disney World Adventureland Steel Band", a rare comingling of two Florida-specific obscurities. Even looking at that LP sleeve, I can't believe that that photo was taken in Florida one sunny summer morning long ago. I can't believe I've stood in that same spot and I can't believe it's all still there now. 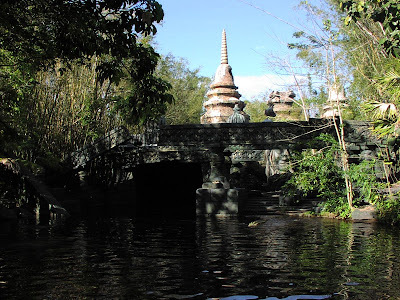 Jungle Cruise Temple - when there's what one might term "layman" discussions of the attractions which Disneyland and Walt Disney World share, the discussion basically tends to follow single bullet-point exclamations. Like: "Pirates at California is better because it has two drops" is really an inarticulate version of "Pirates at California is better because it's longer", which itself is barely skirting the real issue, which is that the California version of the ride is both longer and better. But so it goes, and in such cases one is apt to hear: "Jungle Cruise in Florida is better because it has that temple". This is absolutely true but somehow not remotely enough. It's very difficult to articulate the tidal pull that temple holds over those of us who grew up with it and coming upon it is one of those Walt Disney World moments that never leaves you. 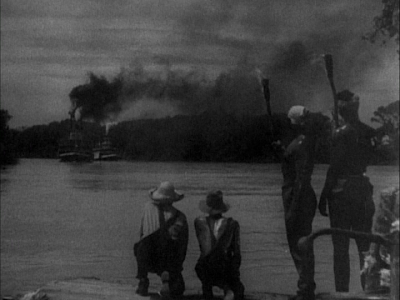 As adults, we can carefully watch forward of the boat and observe how the river has been expertly designed to gracefully pull into view scenes from unexpected directions, which tend to alternate between scenes of beauty, menace, and humor. But the moment those Cambodian ruins pull into view, massive, larger than life, both beautiful and scary, is one of the supreme moments of the engineered miracle at Walt Disney World. Adults still gasp and children quietly simmer away in anxiety. This is a primal experience. What happens inside is even more unexpected, and it does not involve booby traps or skeletons, for this ruin had been moldering away in half sunken splendor for ten years by the time Raiders of the Lost Ark landed on the scene and forever changed the popular conception of what exploring an old temple would be like. It does involve cobras hypnotically swaying amid treasure and heaps of "Old Scratch's Mystery Mine"-style jewels, a tiger menacingly peeking through a hole in the wall, and music that seems to have echoed right out of time, bouncing off those old crumbling stone walls for untold millenia. The effect is more sacred than scary, and although there is nothing overtly supernatural happening here, the implicit effect is that that old Monkey God's power is still alive and well in this dark and gloomy place. Next time through the temple admire that every square inch of the walls are carved and decorated, even those crumbling support beams crisscrossing the ceiling, and how the ceiling dips and undulates and the walls slide this way and that to suggest a temple thrown out of alignment by an earthquake. Watch how the walls slowly move away to reveal new information, always twisting out of sight unexpectedly to suggest greater space that there really is, and note those obscure friezes and murals of ancient peoples falling off the rough hewn blocks. 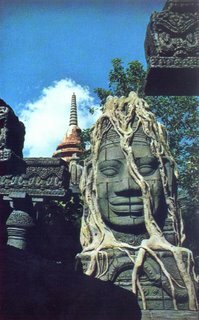 This is also an elemental experience, the bright hot sunlight of the jungle replaced with the cold, dark, wet interior of the temple, then back again, a play of elements and sights and senses that worms its way into our unconscious. This is the definitive discovery and exploration of an ancient mystery site. It doesn't just elevate the Florida version of the attraction above the California version, it shoots it right up into the realm of mastery. The mood inside the temple eventually turns to levity with monkey comedy, and this obliges me to comment on the role of humor in the Jungle Cruise generally. This is an attraction which is universally remembered for its strings of scripted punny jokes and obscure wordplay, but I'd like to point out that all of the comedy actually designed into the ride works marvelously. All of the Marc Davis gags are actually really funny and memorable, from the gorilla looking down the barrel of a gun to the monkey with a jar stuck on its hand. The excellence of the design of the ride is only fully appreciable if the ride is experienced in total silence with no rambling narration. Since the general public does not ever see the ride in this way its reputation is as a rather cheesy creation... but in my eye the Jungle Cruise is a class act. 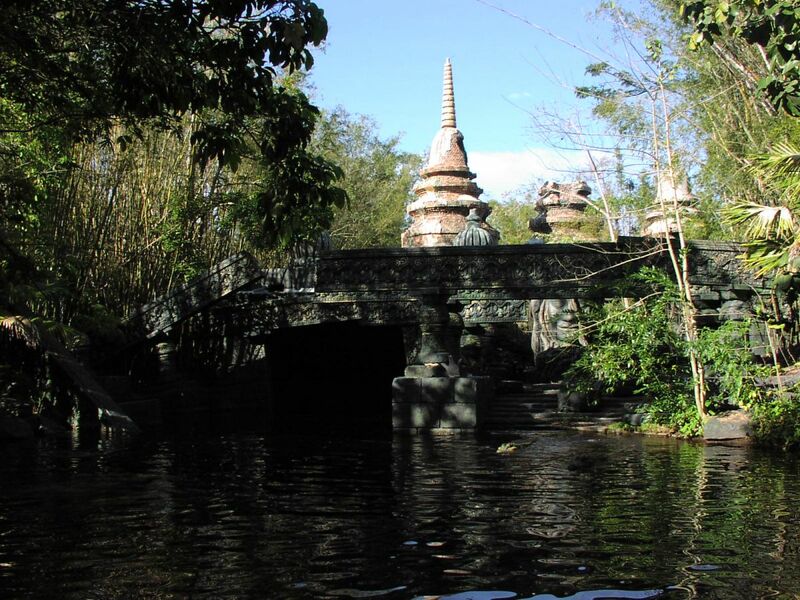 The Cambodian Ruins segment of the Jungle Cruise show is a microcosm of the tones of the Florida ride, tones which the California show is largely without: natural beauty and creeping unease. The Marc Davis led Florida show reveals these beautiful or menacing or silly landscapes to us through a dramatic, cinematic reveal actuated by a masterfully designed river track; in California we simply come across these scenes stuck alongside the boats. It is the difference between a ride cobbled together from different versions and a mature, carefully controlled vision. Apprechiating the Sunken Temple is a key to unlocking the secret brilliance of the Jungle Cruise, as undiluted and effective a piece of WED design as still exists in Florida. One more word about comedy. As much as the Temple scene in the Jungle Cruise is many things - a brilliant design, a lens through which to view the rest of the ride, a memorable and essential experience - it is also a shrine for Marc Davis, and in it we can find many of his skills and interests, but above all we find his masterful blending of comedy and unease. I bring this up because it's been suggested by... me, amongst others... that one way of viewing the tonal shifts in the Haunted Mansion is a split between Claude Coates designing scary and atmospheric stuff and Marc Davis designing funny ghost scenes. This is just one way of viewing it, but it was never intended as anything other than just one way. If we look through Davis' designs for Disney we see him constantly mixing comedy and fright throughout his output, and not just in the Haunted Mansion. For one thing there's this Temple scene at hand, and of course there's also Dead Man's Cove in Pirates of the Caribbean, as effective and undiluted a piece of Marc Davis as you'll find. I suggest we elevate the sunken Temple and the Florida Jungle Cruise in general into the realm of accepted, rather than received, classics. She's labored far too long in her little ghetto of half-scorn. Keel Boat Dock - In that slim little Imagineering "Field Guide" to the Magic Kingdom from five years ago, it was suggested that one linger in the exit area of Big Thunder Mountain to observe the sights, sounds, and engineered miracles of a totally designed landscape.... and that book was almost right. For one, it's difficult to enjoy much of that little elevated boardwalk outside Big Thunder Mountain because a massive tree now blocks your view of the mountain and of course those gurgling geysers have been turned off for years now. But besides, there's a better place, a place where everything sacred and brilliant and beautiful about the Magic Kingdom comes together. It's the exit area for an attraction that's been closed for fifteen years. Down on that little boardwalk near the Haunted Mansion, just north of where the Riverboat docks, is as close to heaven as you'll find in the Magic Kingdom. With the Haunted Mansion to the north, the Riverboat and Frontierland's flickering lanterns to the south, with Aunt Polly's Dockside Inn jutting out into the river on piers, this is the best place in the Magic Kingdom to experience a real clear blue Florida dusk, as the sun slowly sinks behind the silhouetted outline of Big Thunder Mountain, perfectly positioned behind Superstition Bridge connecting the two halves of Tom Sawyer Island, the bridge's red lights reflecting off the rippling water. It's one of those places where The Magic Kingdom, not even a half century old, seems as placidly eternal as nature herself. It's difficult to describe how beautiful this area is, so you'll just have to see it for yourself. Head down the exit ramp of the Liberty Belle nearest the Haunted Mansion. At the bottom, turn right and either head through or unlock the old wooden Keelboat exit gate (this is permissible and easiest to do after the Riverboat has ceased operation for the day). One thing I love about the Magic Kingdom compared to Disneyland is how her Old Man River seems so much more natural and intimate, and as you stand on that low boardwalk inches above the water and listen the feel the water lapping and that mountain rising in the back, that's all the confirmation you'll ever need that theme parks, too, can be a kind of art. This post is part of the Fourteenth Disney Blog Carnival. Please click here to see more Disney Blog Carnival articles!